Marking an important milestone for Argentine science and technology, Y-TEC put buoys to measure this renewable marine resource and promote national energy. The minister of Science, Technology and Productive Innovation, Dr. Lino Barañao, the president of YPF, Eng. Miguel Galuccio and the director of Y-TEC, Dr. Gustavo Bianchi, attended the announcement ceremony of the Axys and Wavescan buoys anchoring as part of the first stage of the “Study of the marine energy resource of the Patagonia Austral”, which is made by Y-TEC, a company that belongs to YPF and the CONICET. The aim of the project is to conduct some activities and measurement campaigns to collect and analyse the capacity factor of the displacement of coastal water, estuaries, and channels of the Mar Austral of our country. This information will be used to assess feasibility studies for power projects that, within the framework of renewable energies, will diversify the country’s energy matrix. During the event, which was attended by the president of the National Scientific and Technical Research Council (CONICET), Dr. Roberto Salvarezza, and the vice president of Technology Affairs, Eng. Santiago Sacerdote, Dr. Barañao put into perspective the announcement. He added that it is estimated that in 2050 there is going to be over 2,000 million people on the planet, what means doubling the amount of energy but none of the current energy sources will be able to satisfy this duplicate demand. Within this framework, the minister stated that “the objective of this project is to obtain renewable and environmentally sustainable energy”. Besides, he explained that “this type of projects are connected with other ones, such as the Pampa Azul, which represents an innovation and linked diverse parts of the government to focus on the sea from different points of view. The minister also highlighted that “these are not isolated activities; they are all part of an innovative planning from Argentina to the future”. At the event, Eng. Galuccio remarked that “Y-TEC is a strong commitment to innovation with two main axes: the non-conventional one and the alternative energies, which are not developed in the country such as the wind and solar energy, or in this case, from the sea. In seeking energy self-sufficiency, we need to think beyond oil and gas, and these energies have to be considered. Our spearhead is Y-TEC and as regard this, we are taking a step in energy unexplored and with great potential”. For his part, Dr. Bianchi highlighted “the energy potential we have in all the coasts of the Argentine sea”, and stated that “this is a landmark in Argentina because we start working on wave power”. Eng. 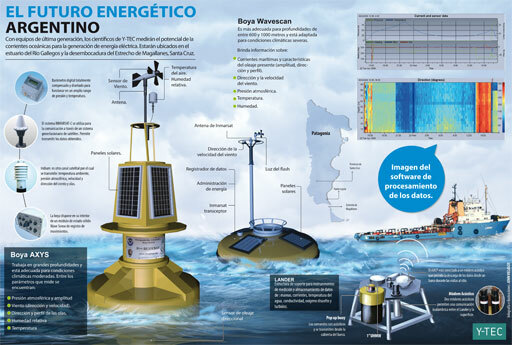 Santiago Sacerdote, who is a member of the Y-TEC Board, explained that “for three years, these buoys are going to be measuring diverse factors that, in technological terms, will enable us to analyze what is the turbines load factor that can generate electricity at sea”. Likewise, he remarked that the project has a group of researchers from the Patagonian National Research Center (CENPAT-CONICET) who “provide the analysis of the environmental impact not only from where the buoys were placed but also from the entire Patagonia coast. The idea is to provide CONICET laboratories with more information, new measures, and dynamic analysis to find the best places to install future hydroelectric turbines”. Furthermore, Eng. Bianchi spoke about the study conducted by the biologists, oceanographers and different CONICET researchers at the CENPAT “to study and mark the migrations of marine fauna and the movements of the dunes on the seabed” for the installation. Finally, Sacerdote highlighted the political decision and the articulation of different institutions to undertake this kind of project and concluded that “to find alternative or renewable energies is part of our strategic look for the next 20 years”. The meeting was attended by the dean of the Facultad Regional Santa Cruz de la Universidad Tecnológica Nacional (UTN), Eng. Martín Goicoechea, the vice president of Servicios Compartidos de YPF, CPN Sergio Affronti, and the researchers Dr. Gustavo Seisdedos (Y-TEC) and Eng. Norma De Cristófaro (UTN, Regional Santa Cruz), together with other authorities, civil servants and researchers. To look at the infographic click here. On December 2nd, 2014, at the estuary of Río Gallegos the Axys anchoring was carried out, the first of the two metocean buoys. Then, on December 3rd, the second one, which was called Wavescan, was placed on the area of the Cabo Vírgenes. They will be connected via satellite to provide details of its position, temperature, atmosphere and pressure. Besides, there are important instruments such as barometers, wave energy meters and sensors to survey meteorological data. These three years of data collection and analysis will provide first the information for a data library with raw and processed information available to perform feasibility studies for power projects. Secondly, it will give professional training for technologists and young researchers in Marine Sciences, Materials Science, Corrosion, Biocorrosion, Electrochemistry of seawater and Maritime Operations.